Creative Lynks: April Fool ??? Anything and everything feminine, or whatever might appeal to the ladies, as long as your main image is stamped and fits the theme, of course. And since we have a fab prize of a £25 voucher from our lovely sponsors Be Creative, what's not to like? 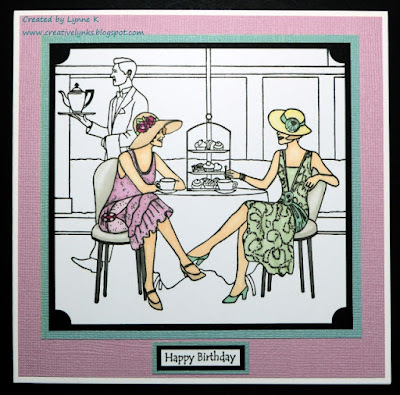 Although the stamp I've used for my card, "Afternoon Tea" by Docrafts Papermania, is old now, it's still a lovely design and works well for various occasions. I chose only to colour the ladies (with Promarkers), to focus the attention on them and kept the rest of the design quite simple and graphic. The sentiment is by a sadly long defunct company, Eclipse Cards & Crafts, but its small size is useful when I want to convey the message without it detracting from the picture. There's plenty of girly inspiration over on the Challenge Blog, where my teamies have some gorgeous samples for you. Looking forward to seeing yours! I've been admiring this for the last couple of weeks Lynne, I just love how you have coloured just the two images and left the background B&W, works so very well. Happy Easter and keep warm - it's 4 deg here today. 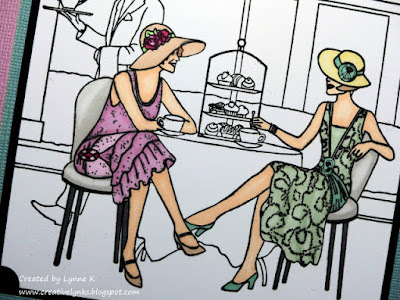 Oh Lynne this is gorgeous - I love the way you have just coloured the ladies! A great idea to just colour the two ladies enjoying their afternoon tea Lynn - it really does make them the focal point of the card. Lovely! So what a geat way to colour this stamp. I love it. 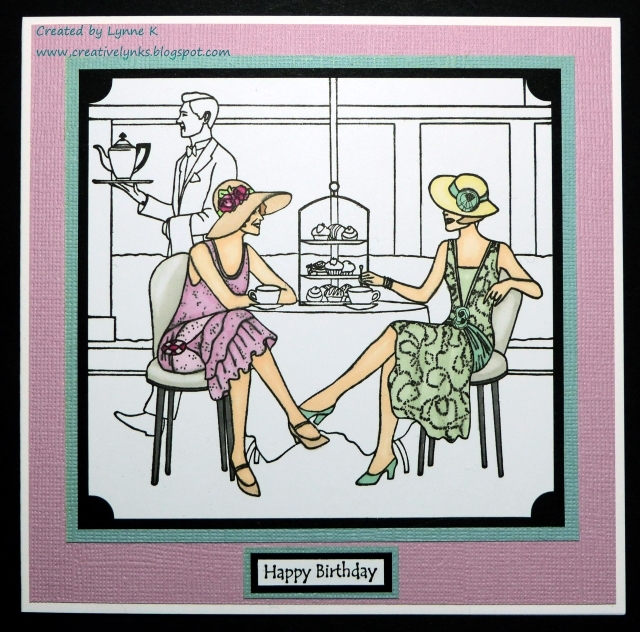 This is so elegant Lynne, I love the image and the way you have coloured only parts, very striking.